NWA Democrat-Gazette/CHARLIE KAIJO Dennis Kronberg of Wausa, Neb. (center) installs refrigeration lines for air conditioning, Friday, June 8, 2018 on Passion Play Road, across the street from the Washington Regional clinic in Eureka Springs. 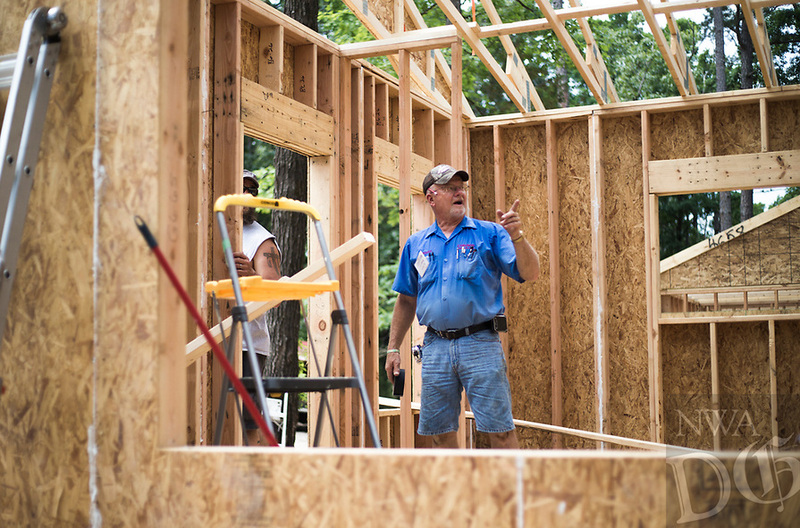 Eight tiny houses are being built in Eureka Springs, which has a dearth of affordable housing. They're being constructed by 66 volunteers from 13 states with World Mission Builders. They began work on Monday (June 4) and should finish most of the construction by the end of next week (June 15). Then local volunteers will finish out the interiors and put shingles on the roofs. The first eight houses are part of what will be called ECHO Village. Plans are to eventually have 26 houses in the village. It's a project of Eureka Christian Health Outreach, which bought 10 acres for the village. The same group started ECHO Clinic in Eureka Springs in 2005. It provides free medical care to the uninsured and people on a low income.